We’d love your help. Let us know what’s wrong with this preview of Northanger Abbey by Val McDermid. Jane Austen in the hands of queen of crime, Val McDermid. Get ready for a very different Northanger Abbey. For Cat Morland life being home-schooled in Dorset is unendurably ordinary. To cope, she devours as many novels as possible, especially anything supernatural. But if Cat can tear her eyes away from the page, she’s in for a shock: the very stuff of her dreams is about t Jane Austen in the hands of queen of crime, Val McDermid. Get ready for a very different Northanger Abbey. For Cat Morland life being home-schooled in Dorset is unendurably ordinary. To cope, she devours as many novels as possible, especially anything supernatural. But if Cat can tear her eyes away from the page, she’s in for a shock: the very stuff of her dreams is about to come true. An invite to the Edinburgh Festival from some wealthy neighbours throws her in the way of a mysterious young man, Henry Tilney; a like-minded friend, Isabella Thorpe; and her odious brother, who threatens to ruin Cat’s chances of adventure. But this heroine is not so easily deterred, especially when she’s singled out by the Tilney family to stay with them at their imposing gothic castle, Northanger Abbey. You are going to thank me for reading this book so you don't have to. Apparently, there is something called the Austen Project where writers update Jane Austen's novels to make them more accessible to teens. Imagine any Austen novel without the zing, without the humor, without the beautiful language. That's this book! You're welcome! To give Val McDermid credit, I'm sure she produced exactly the novel she was asked to. Having just reread Northanger Abbey, I was pretty familiar with the text. It s You are going to thank me for reading this book so you don't have to. Apparently, there is something called the Austen Project where writers update Jane Austen's novels to make them more accessible to teens. Imagine any Austen novel without the zing, without the humor, without the beautiful language. That's this book! You're welcome! To give Val McDermid credit, I'm sure she produced exactly the novel she was asked to. Having just reread Northanger Abbey, I was pretty familiar with the text. It seemed like McDermid went paragraph by paragraph updating the language. Carriages became cars, letters became texts... The teens are very cool, to be accessible. They say things like "totes" and "amazeballs" . Do teens actually talk like that? I totes want to know. The location changed from Bath to Edinburg. Book/ movie festival. And of course there are balls. Dance balls, not amazeballs, silly! So, mostly McDermid followed the script, but she did veer off in a few places. Guess why General Tilman kicked Cat (our heroine Catherine) out if the house. Not because she was poor. Tilman doesn't care about money. He just wants his kids to be happy. What a good dad! This was a minor problem for me because as McDermid pretty much rewrote this word for word, G.T. does an awful lot of talking about money. Okay, back to the story. I'm not even going to put a spoiler tag here. If you still plan on reading this book, I don't care about you. So, did you guess why? It's because he thinks she is...are you ready for this? A lesbian. Yep. That's why he kicked her out. The rejected John Thorpe told him so. Of course, Cat is not a lesbian, she's in love with Henry. Ooooh, but there's a twist! Eleanor actuallyis a lesbian! Next. You know how In Austen's novel the girls are obsessed with The Mysteries of Udolpho in all it's gothic glory? Well, here the girls are obsessed with, you probably already guessed this, vampire books. Cat actually suspects the entire Tilney clan of being vampires. Another change. In Austen's NA, General Tilney was a loving husband who mourns the death of his wife. Here, according to Henry, he's a controlling ogre who sucked the life out of her, bled her dry. Get it! I was so excited & full of anticipation when I first heard about The Austen Project, but my hopes were doomed after the fiasco the modern Sense & Sensibility & Emma turned out to be. As a consequence, I was wary of this book at first, but after getting through the first chapters, I quickly realised that it would be an exception. Kudos to Val McDermid for translating the plot so nicely into 21st century (ridiculing vampire-obsession, like Jane Austen did the gothic novels) & keepin I was so excited & full of anticipation when I first heard about The Austen Project, but my hopes were doomed after the fiasco the modern Sense & Sensibility & Emma turned out to be. As a consequence, I was wary of this book at first, but after getting through the first chapters, I quickly realised that it would be an exception. Kudos to Val McDermid for translating the plot so nicely into 21st century (ridiculing vampire-obsession, like Jane Austen did the gothic novels) & keeping it entertaining almost all the whole way through. This edition of Northanger Abbey is an updated take on the classic tale by Val McDermid, bestselling crime writer. In it, Cat Morland leaves her quaint hometown and home-schooled life to go to the Fringe festival in Edinburgh courtesy of friends of the family. Cat quickly takes the place by storm and is welcomed in to the bosom of the Thorpe family, made up largely of bratty children. When Cat makes friends with Henry Tilney and his sister Ellie, she is invited to their stately family home, wher This edition of Northanger Abbey is an updated take on the classic tale by Val McDermid, bestselling crime writer. In it, Cat Morland leaves her quaint hometown and home-schooled life to go to the Fringe festival in Edinburgh courtesy of friends of the family. Cat quickly takes the place by storm and is welcomed in to the bosom of the Thorpe family, made up largely of bratty children. When Cat makes friends with Henry Tilney and his sister Ellie, she is invited to their stately family home, where her imagination runs wild with murder conspiracies. Oh dear. Oh dear oh dear oh dear. I think I lost the will to live with this book when the author decided to take Catherine Morland's gothic style, macabre imaginings, and try to recreate them but with Cat's ridiculous and cringey Twilight inspired fantasies. Seriously? Twilight? Vampires? Again? I've read so many really good and unique books lately I have no time for a book that's shoving a vampire in there because everyone's obsessed with them. The whole Twilight thing? Isn't that just so 2009? I'm not even going to mention the text speak that was working on my last nerve. I understand. You're trying to do a modern retelling, but there's only so many times I can see words like "LOL" before I start to lose my mind. The teen slang was just too overblown. Quite blatantly an older person imitating their view on younger people. I could make a drinking game of the cliche's. The "young person narrative" was wrong, unrealistic and incredibly hard to relate to. I had no connection to Cat. I thought she was incredibly brainless and stupid. I literally ended up hating her. And wanting to slap her. The romance was lacking severely. I didn't buy it at all. The misunderstandings between the two where the most ridiculous things I have ever read that took some long winded, stupid explanation to clear up. I didn't appreciate at all how the author shoehorned LGBT in to the book. Ellie's father chucks Cat out of Northanger because he thinks she's a lesbian. Henry believed his Dad (who'd been told by another ridiculous character) because you know girls can't hug their friends apparently without obviously being a lesbian. It was shoehorned in, written in terribly, and addressed horrendously. "oh gotta think of something bad enough to get her chucked out, better make her a lesbian". It was handled very wrong. This may be the most disappointing thing I will read this year. After the abomination that was Joanna Trollope’s version of Sense & Sensibility, I was confident – oh, so confident – about the inevitable direness of Val McDermid’s Northanger Abbey. There I was – poison pen at the ready, sarcasm ready to drip like venom, scalpel sharpened to rip the very heart out of it – and dang me if it doesn’t turn out the book’s not too bad at all! In fact – and you’ll never know h Almost totes amazeballs! This may be the most disappointing thing I will read this year. After the abomination that was Joanna Trollope’s version of Sense & Sensibility, I was confident – oh, so confident – about the inevitable direness of Val McDermid’s Northanger Abbey. There I was – poison pen at the ready, sarcasm ready to drip like venom, scalpel sharpened to rip the very heart out of it – and dang me if it doesn’t turn out the book’s not too bad at all! In fact – and you’ll never know how much it hurts me to say this – it’s actually quite good fun. To be fair, McDermid’s task was always going to be easier than Trollope’s. While Austen’s Sense & Sensibility is a serious book which casts a penetrating light on aspects of the society of her time that no longer exist in ours, Northanger Abbey is a much lighter concoction that deals with the eternal subjects of true and false love, and obsession with literary trends. So, while I remain unconvinced of the need or merit of updating Austen at all, this is probably the one that lends itself most easily to updating. After an hour of being whirled and birled, of Gay Gordons and Dashing White Sergeants, of pas de bahs and dos a dos, they broke for refreshments. Cat was uncomfortably aware that she was sweating like an ill-conditioned pony and that Henry seemed positively cool by comparison. Before she could open the book, there was a clap of thunder so loud and so close that Cat cried out in terror. The room was abruptly plunged into darkness and a second deafening thunderclap vibrated through the air. Cat curled into a ball and moaned softly. What terrible powers had her discovery unleashed? McDermid has stuck pretty closely to the original story but has made some changes to the characters and plot to make it fit better in a modern world. Cat isn’t quite as hero-worshipping as Catherine from the original – she’s very taken with Henry and ready to learn from him but she’s got plenty of character of her own. McDermid has solved the problem of modern technology by siting the Abbey in a reception blackspot, and has used the current obsession for vampire novels very amusingly as a replacement for the ‘horrid novels’ of the original. (I hoped they might be real books – Poltergeist Plague of Pabbay, Vampires on Vatersay – but alas! It appears not.) McDermid is a Scottish author, of course, so gives an authentic and wryly humorous flavour of the hugely popular Edinburgh Festival, often as noted for the peculiarity of some of the productions as for their quality. Naturally Cat is mainly interested in the Book Festival and I doubt there is anyone better qualified to write about that event than Val McDermid. Cat had convinced herself that in spite of Henry Tilney’s failure to appear at the Book Festival grounds, he would surely attend the dramatic adaptation of last year’s best-selling novel about love, zombies and patisserie, Cupcakes to Die For. Had they not touched on the subject of the fluency of women’s writing at Mrs Alexander’s dance class? Was this not the most sought-after ticket of the Fringe? And was not the Botanic Gardens the coolest of venues? The book isn’t perfect and there are a few things that grated a bit. John Thorpe, a money-grasping buffoon in the original, appears to have turned into some kind of anti-Semitic fascist in this one, which seemed a little odd. The updating of the language has replaced Austen’s deliciously light wit with a heavy blunt instrument in too many places. And the big reveal at the end, as to why Henry’s father should suddenly have changed towards Cat, is the main disappointment of the book – McDermid’s choice of reason was sadly very typical of her and not at all within the spirit of the book, I felt – old or new version. However, overall I have to admit that I enjoyed this quite a lot and, while it will never compete with the original for any true Austen fan, it is a light, fun read with enough of an edge to avoid being just throwaway chick-lit. So this grumpy and disappointed reviewer is left with nothing to do but congratulate Val McDermid on achieving the impossible – making me give a positive review to one of these hideous Austen Project books. I shall now go off into a dark corner and pout. NB This book was provided for review by Amazon Vine. She spoke with some diffidence as Mrs Calman cleared away the soup dishes and placed a selection of curries and side dishes in the middle of the table. ‘I wonder whether it might be possible for me to use your wifi?’ She caught the look of alarm shared by Henry and Ellie. I am not an Austen purist. I am not all that attached to the original Northanger Abbey. The idea of McDermid re-telling the story for a modern audience was just too good to pass up. And does it work? Amazingly, I found myself giggling along - especially whenever McDermid did lift the story out of its time and applied a hefty dose of 21st century cynicism to it. But it was not just the idea of modernising the settings and gadgets. She also transformed the dialogue to appropriate it to a YA story set in the present day UK - and choosing the Edinburgh Festival as the modern day equivalent of Bath was just inspired. What better place for an imaginative, book-besotted girl than the lively cultural joys of the Edinburgh Fringe Festival? That’s where author Val McDermid sends Catherine, aka Cat, Morland instead of Bath in this Austen Project update of Northanger Abbey. This is the second book in the series, Joanna Trollope’s modern take of Sense & Sensibility was first, and like its predecessor this Northanger Abbey sticks very close to the original, just reimaging the setting and circumstances, though in What better place for an imaginative, book-besotted girl than the lively cultural joys of the Edinburgh Fringe Festival? That’s where author Val McDermid sends Catherine, aka Cat, Morland instead of Bath in this Austen Project update of Northanger Abbey. This is the second book in the series, Joanna Trollope’s modern take of Sense & Sensibility was first, and like its predecessor this Northanger Abbey sticks very close to the original, just reimaging the setting and circumstances, though in this case McDermid adds some clever contemporary twists at the end. Instead of Gothic novels Cat is happily obsessed with vampire books and she’s especially excited to be in Edinburgh because she thinks it’s the perfect setting for all things paranormal--she can easily imagine vampires around every corner, which of course becomes a problem. This Cat is just as artless and eager as her original and all the main characters from Austen’s novels are back in modern forms. Charming Henry Tilney is now a lawyer instead of a clergyman, Isabella Thorpe is just as selfish and manipulative as ever but with more range because she can tweet and post, Eleanor Tilney has a new reason to be lonely--revealed late in the story--and the Tilney’s abbey home is now suitably isolated in the Scottish Borders, outside the range of cell phones reception. Abbruch nach 9%. Ich hätte es wissen müssen, war aber neugierig, was man heute aus dem Austen-Stoff machen kann. Und ich habe noch nie etwas von Val McDermid gelesen, die doch eigentlich zumindest spannend schreiben sollte. Aber in was für eine Teenie-Sch*** bin ich da hineingeraten. Cat verschlägt es nicht nach Bath, sondern zu einem Theaterfestival nach Edinburgh. Dort hat sie Gelegenheit an einem Event teilzunehmen, für das sie zuvor schottische Tänze erlernen muss. Dabei trifft sie auf den Au Abbruch nach 9%. Ich hätte es wissen müssen, war aber neugierig, was man heute aus dem Austen-Stoff machen kann. Und ich habe noch nie etwas von Val McDermid gelesen, die doch eigentlich zumindest spannend schreiben sollte. Aber in was für eine Teenie-Sch*** bin ich da hineingeraten. Cat verschlägt es nicht nach Bath, sondern zu einem Theaterfestival nach Edinburgh. Dort hat sie Gelegenheit an einem Event teilzunehmen, für das sie zuvor schottische Tänze erlernen muss. Dabei trifft sie auf den Aushilfslehrer Henry Tilney: "Er hatte nicht das sorgfältig gepflegte Aussehen eines Boygroup-Mitglieds, aber sein Gesicht war attraktiv und einprägsam." In the second installment of The Austen Project, bestselling Scottish crime writer Val McDermid takes a stab at a contemporary re-imagining of Jane Austen’s most under-appreciated novel, Northanger Abbey. Written in the late 1790’s when Austen was a fledgling writer, this Gothic parody about young heroine Catherine Morland’s first experiences in Bath society and her romance with the dishy hero Henry Tilney is one of my favorite Austen novels. Fresh and funny, the writing style is not as accompli In the second installment of The Austen Project, bestselling Scottish crime writer Val McDermid takes a stab at a contemporary re-imagining of Jane Austen’s most under-appreciated novel, Northanger Abbey. Written in the late 1790’s when Austen was a fledgling writer, this Gothic parody about young heroine Catherine Morland’s first experiences in Bath society and her romance with the dishy hero Henry Tilney is one of my favorite Austen novels. Fresh and funny, the writing style is not as accomplished as her later works but no one can dismiss the quality of Austen’s witty dialogue nor her gentle joke at the melodramatic Gothic fiction so popular in her day. I was encouraged by the choice of McDermid as author and intrigued to see how she would transport the story into the 21st century. Introduced to theater, art and books, and thanks to fashionista Mrs. Allen, Cat soon acquires a new wardrobe and dancing lessons where she partners with a charming and witty young attorney, Henry Tilney. After researching Henry on Facebook and Google she discovers that his father is the much-decorated general who made his name in the Falkland’s war before she was born. Even more interesting to Cat’s Gothic infused imagination, he owns Northanger Abbey, a medieval Borders abbey in Scotland. Cat also meets Mrs. Allen’s long-lost school friend Martha Thorpe and her three daughters, one of which is just Cat’s age. Bella, who recognizes the Morland last name, knows Cat’s elder brother Jamie who is attending Oxford with her brother Johnny. Before long they were “gossiping about the things that entertain young women of a certain age and type,” and becoming bff’s. The story continues, mirroring the text of Northanger Abbey page for page, and scene for scene. Cat travels to Northanger Abbey as guest of the Tilney’s and the story turns Gothic and mysterious – just as Austen had devised. 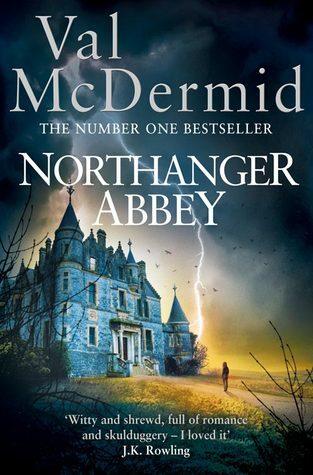 McDermid made clever, creative and sensible choices in modernizing Northanger Abbey by moving the action from England to Scotland. The Edinburgh Festival easily replaces eighteenth century Georgian Bath allowing for a social hub similar in context: theater, shopping and country dancing. Later, we are treated to a really creepy medieval setting for a Scottish castle/Northanger Abbey. Cat is appropriately addicted to modern Gothic novels rivaling the famous Northanger Canon: Herbridean Harpies, Ghasts of Ghia and even Pride a Prejudice and Zombies! McDermid builds the vampire theme slowly, allowing Henry and Ellie to be pale in complexion, anachronistic in demeanor and just mysterious enough to trigger Cat’s imagination. Her characterizations are spot on: Henry is droll and swoon-worthy as ever, Cat a bit air-headed and impressionable, Bella a slick piece of work, and General Tilney deceptive and tyrannical. The plot plays out as one would expect, and if you had not read Northanger Abbey before you would not notice that the author has really created a complete translation, scene for scene, and sometimes word for word—a No Fear Shakespeare version of Northanger Abbey. While I admired McDermid’s creative choices to bring the story into the modern world (cell phones, Facebook, language and culture), I was immediately puzzled by her choice of narrative style. This novel is really a retelling instead of the re-imagining that it was advertised as. The downside of a translation is in its creative limitations, resulting in McDermid’s sentences being affected and unnatural. I just wanted her to break out of the stranglehold she had placed on herself and use the plot and characterization as a spring board, and not a noose. Limiting herself in this manner may have been her way of honoring Austen, but I think she has done a great disservice to her own writing. Having not read any of her acclaimed crime novels I have no idea of her real talent. I believe that Austen herself, who honed her craft so precisely, would be baffled at one author lessening their gifts at the expense of another. Like the reaction to Joanna Trollope’s contemporary re-imaging of Sense and Sensibility published last year, whenever you fiddle with the classics there are bound to be those who are open to the concept and those completely closed off. I read this novel with every intention of enjoying it. In hindsight, I do not think that it was written for an Austen fan familiar with the original, but for the uninitiated who may view it in a completely different light. - It’s the Austen Project! : 6 best-selling contemporary authors are tackling and updating the 6 major works of Jane Austen! And I haven’t read any of them yet! -NA Won: In the vote I held at the beginning of the month, Northanger Abbey was the most voted for option, over Sense and Sensibility by Joanna Trollope. But aside from that, Northanger Abbey inspired novels are definitely scarce and I’m always wanting to read more! - Plausible Recreation: All the characters were updated to our modern world and easily recognized. Cat is a seventeen-year-old homeschooled student who has never left her home county, which appropriately made her inexperienced, innocent, and trusting. Bella was the insincere friend who was wild for vampire novels and male attention, John Thorpe was obsessed about his car and often talked nonsense, and the Tilney family was reserved and mysterious. While these updates weren’t the most creative or inventive, they were believable and translated well. - Culture Fest on the Fringe: The Allens invite Cat to come spend a month with them in Ediburgh while they attend the Festival and sample a variety of performances and events. What a magnificent treat for Cat, I would gladly like to be in shoes! One woman shows, viewings, talks, and author signings – I enjoyed hearing about all the events they attended and would have loved even more time spent describing them. - Take Me to England: Quaint country villages, a bustling historic city alive with entertainments and society, and charming Scottish squares near Gothic abbeys– it was lovely to be surrounded by sites, sounds, and descriptions of all these intriguing and scenic locales. In addition, I love learning some new British expressions such as “chuffed,” “skint,” “clever clogs.” It was great to be back in the UK! - Formulaic: This story felt like an exact modern-day mirroring of Jane Austen’s Northanger Abbey. Every part of the story was there – the characters, the plot elements, the conflicts – all translated to our world…even when it sometimes felt forced. When I read modern-day adaptations of Jane Austen novels, I often find myself praising the author’s work as clever and original. I love looking for their creative parallels, subtle nods, and unique twists. I could not do that with this story. It wasn’t clever at all…it was a carbon copy of Jane Austen’s work and for what I could tell didn’t include any of the author’s own sparkle or imagination. - Disappointing Developments: Since Cat loves her some vampire stories, she of course assumes that the Tilneys might be vampires (you know, because they have pale complexions, didn’t eat a lot that one time, and opted to not go for a walk on a very hot and sunny day.) I know this was a very plausible translation for Cat in our modern world especially with the vampire craze that was popular a few years ago, but I felt it lacked conviction. Especially since Cat wavered back and forth on it herself. I also thought the whole General-Tilney-interested-in-Cat-because-she-will-be-rich was dated and slightly implausible. And it was weird how the author made such a point of establishing that belief and then abandoned it in the end for something else. Readers who don’t consume a healthy diet of Austenesque literature may find this Ms. McDermid’s recreation to be impressive and admirable. But I’m afraid I didn’t. I’ve seen other Austenesque authors do it better (Meryton Press, Indie Jane Press – I’m looking at you.) I recommend this story to readers who would love to see a modern-day retelling of Northanger Abbey that very closely resembles Jane Austen’s Northanger Abbey. First off, I should say I like Jane Austen. I like her books a lot. However, the only two I've actually re-read in the last 20 years or so are Pride & Prejudice and Sense & Sensibility. The others... well, I keep meaning to, but with so much else to read, I've not yet got around to it. This means I've only read the original Northanger Abbey once, about 18-20 years ago, and ... well, frankly, don't remember much at all about it. Nothing, really. So unlike with Joanna Trollope's version of S First off, I should say I like Jane Austen. I like her books a lot. So unlike with Joanna Trollope's version of Sense & Sensibility, which was always going to suffer a bit due to me having a considerably better idea about the original (and the original being my favourite Austen novel at that), I approached Val McDermid's modernisation of Northanger Abbey with a pretty much unprejudiced mind - this was, for all intents and purposes, going to be a fresh read for me. And I think that helped. A lot. Because I really liked this book. A lot. I was struck by how modern YA this really felt (complete with vampires and insta-love!) - from the little I do remember of the original, I do think Northanger Abbey is the most modern YA like of Austen's works to start with, and this version shows how well it can work with just some basic changes (social media! cars instead of horses!). I loved the setting of the Edinburgh Book Festival; it seemed a perfect fit. I'm not 100% convinced of the authenticity of all the texts and e-mails and teen dialogue, but neither did it throw me out of the book at any time, so that was good enough for me. Also, I liked Cat. A lot. She's awfully naive - not just sheltered, but just, well, perhaps a little more naive than one would expect from a 21st century Western teen - and at times I wondered if it hadn't worked better, characterisation-wise, if she'd been aged down a bit; then again, having the romance be between a 17-year-old and a young man old enough to be a qualified lawyer probably already stretches contemporary YA conventions somewhat. Also, plenty of adults believe in paranormal stuff, so Cat having such deep convictions that her favourite fictional worlds may just translate into reality isn't all that shocking. What I didn't care for .. Henry. Yeah, most of the time he was fun and what not, and I could see a naive 17-year-old fall for that good-looking young man, but eh. There was something about him I disliked intensely - in particular his tendency to be condescending (even when always sort of apologising later, mostly with a "I should have realised this is just what you girls are like" tacked on) and jump to conclusions, believing known scoundrels' words even while scolding Cat for being naive and taking people at face value. Basically, he struck me as a man I wouldn't, ever, want to marry; I'd like to believe he improves, but it's just as possible that the older he gets, the more he'll turn into someone who likes to lecture little wifey first and think later. Blegh. Others can keep this one; I don't want him. Also, the very ending felt a bit rushed, and the explanation for what happened re: Cat and General Tilney in Northanger Abbey was... well. I'm not sure really how I feel about it. I derived little pleasure from the first adaptation in this series (the Sense and Sensibility one), but this was a happier experience. Val McDermid did a good job coming up with modern analogues for the original story (e.g., homeschooling to account for Catherine Morland’s extreme naïveté). The dialogue was very well done; I especially appreciated Henry’s wit, which was clever without meanness. And Bella was totally hilarious; she dominated every scene she was in. Henry Tilney is my favorite JA h I derived little pleasure from the first adaptation in this series (the Sense and Sensibility one), but this was a happier experience. Val McDermid did a good job coming up with modern analogues for the original story (e.g., homeschooling to account for Catherine Morland’s extreme naïveté). The dialogue was very well done; I especially appreciated Henry’s wit, which was clever without meanness. And Bella was totally hilarious; she dominated every scene she was in. Henry Tilney is my favorite JA hero (at the moment), so I came prepared to like him in this version, and did. Catherine (Cat) Morland is a little more intellectual in this retelling than in the original—though still without worldly wisdom—leading me to hope that she and Henry might be better suited for the long haul than in the original. If you can improve on Jane Austen, by all means do so! One thing I missed that was in the original was the way JA systematically set up the expectations of gothic romance, only to undercut them over and over with down-to-earth reality. McDermid introduces modern-day gothic analogues, such as Cat’s obsession with vampires, but we simply hear her internal speculations about these elements without having the genre’s clichés so integrally woven into the plot. Speaking of the vampires, I thought that element was taken a bit too far. It wasn’t necessary for Cat to believe they really existed; the story would have worked just as well had she merely thought the Tilneys reminded her of vampires. She had enough fodder for suspicion with regards to the general and his dead wife that she didn’t need to take and hold such a ridiculous idea. Adding in the vampire element simply muddied the revelation scene. Quibble time: I did not appreciate the various coy references to Pride and Prejudice. They didn’t make logical sense to me—if Jane Austen existed and published P&P, why would she not have published Northanger Abbey, which she wrote before P&P? Just distracting. Another quibble is that I did not really see why Cat and Eleanor (sp? Elinor?) Tilney would have become friends in the first place. Lastly (**spoiler! spoiler! **), I saw no particular reason for Henry to jump right to a proposal to Cat in the end; surely they could have begun by dating. I very much liked the Edinburgh setting, and the vivid descriptions of the abbey and Henry’s house. The story moved along nicely, and gave me a lot of laughs. This is volume two of the Austen Project, where the six completed novels of Jane Austen are being transported to modern times by six different authors. This is the first of the three published so far that I've read and also the first book by Val McDermid I've ever read. It's pretty faithful to the original for the vast majority of the time. Catherine (Cat) Morland is taken to the Edinburgh Festival, rather than Bath, by Mr. and Mrs. Allen and the titular Abbey is in the Scottish Borders. Cat's naivety is explained by the fact that she and her siblings have been home schooled by her parents, something that's quite difficult to get permission for here in the UK. She meets Henry Tilney at a Scottish dance class and also Bella and Johnny Thorpe in Edinburgh and to me the latter pair are probably even more annoying than in canon. I've actually come across young people who speak exactly like them: "totes amazeballs" anyone? It winds me up every time! Johnny comes across as a young version of Jeremy Clarkson, which I guess was the point. I didn't take to this Henry as much as the original but Ellie was fine. Two major plot points I have trouble with. The first is with Cat's conviction that the Tilneys are vampires. That comes up quite early on, so I'm not being too 'spoilery' there. It just seems to be too over the top to me. The second is with the reason eventually given for Cat's sudden eviction by the General. I won't say what that is because it would be a spoiler, but it's not the same as canon. Bravo Val McDermid! Having just completed reading Jane Austen's original Northanger Abbey I felt that this contemporary re-imagining was a very faithful adaptation; certainly with changes but keeping with the feel of the original. Val McDermid does a sterling job of re-imagining Northanger Abbey as a contemporary coming-of-age story. She keeps all the same characters: the shopaholic Susie Allen, Cat's new friend Bella Thorpe, who shares her passion for supernatural novels; Bella's obnoxious broth Bravo Val McDermid! Having just completed reading Jane Austen's original Northanger Abbey I felt that this contemporary re-imagining was a very faithful adaptation; certainly with changes but keeping with the feel of the original. Val McDermid does a sterling job of re-imagining Northanger Abbey as a contemporary coming-of-age story. She keeps all the same characters: the shopaholic Susie Allen, Cat's new friend Bella Thorpe, who shares her passion for supernatural novels; Bella's obnoxious brother John, who switches the open carriage of the original for a flashy sports car; Cat's own brother James and of course, Henry Tilney, his sweet natured sister, Eleanor and their rigidly formal father, General Tilney, updated to a Falklands hero. Edinburgh takes the place of Bath and Northanger Abbey is now moved to the Scottish Borders. The text was peppered with popular culture and moving the action from Bath to Edinburgh for the annual festival made sense. Having both novels side by side made it clear that Ms. McDermid had mirrored the original chapter-by-chapter. Overall, I felt she did a better job than Joanne Trollope did with Sense and Sensibility though to be fair that is one of Austen's most famous works whereas Northanger Abbey is less well known and regarded. The subject matter being satirised is ripe for updaing with the current popularity for paranormal romances. So Cat's fantasies about Twilight and sparkly vampires fits well. In addition, Henry came much more alive on these pages than I felt he did in the original. It made the romance between he and Cat feel more vital. In conclusion I agree wholeheartedly with J. K. Rowling who wrote: "'Val McDermid’s brilliant re-working of Jane Austen’s original shows that innocent, bookish girls in thrall to the supernatural have changed surprisingly little in two centuries. Witty and shrewd, full of romance and skulduggery – I loved it." I did too. I loved this. Any flaws it may have had I completely missed because I was so immersed. I loved every second of it. I'm only sad that Val McDermid isn't the author of the rest of the Austen Project, because I'm not convinced Curtis Sittenfeld can rope me into her Pride and Prejudice as effectively and thoroughly as McDermid did with Northanger Abbey. I've always loved the Austen original, but this was just delightful. Edited to add the possibly provocative addendum after reading the upvoted revie I loved this. Any flaws it may have had I completely missed because I was so immersed. I loved every second of it. I'm only sad that Val McDermid isn't the author of the rest of the Austen Project, because I'm not convinced Curtis Sittenfeld can rope me into her Pride and Prejudice as effectively and thoroughly as McDermid did with Northanger Abbey. Nažalost , moram da priznam da se originala slabo sećam iako sam ga čitala davnih dana - moja ideja je bila da prvo pročitam ponovo sve originale a potom i njihove moderne pandane ali bila sam u biblioteci, naišla sam na knjigu i nisam mogla da odolim pošto su stalno izdate. Obožavam Val Makdermid i mislila sam da bi baš njen pristup klasiku s obzirom na milje iz kog dolazi mogao biti najintrigantniji. Žao mi je što moram da kažem da sam bila daleko od istine. Val je vrlo malo odstupala od original Nažalost , moram da priznam da se originala slabo sećam iako sam ga čitala davnih dana - moja ideja je bila da prvo pročitam ponovo sve originale a potom i njihove moderne pandane ali bila sam u biblioteci, naišla sam na knjigu i nisam mogla da odolim pošto su stalno izdate. Val je vrlo malo odstupala od originala -a gde i jeste, pred kraj, bolje da nije jer je to hendlovala prilično loše. Pokušavam da izbegnem spojlere . Ceo Austen projekat osmišljen je da bi se Džejn Ostin modernizovala, približila mlađoj publici i zapravo to je prilično dobra ideja. U teoriji. Mlada nisam, ni moderna( čak ni kad sam bila mlada) ali mi je malo teško da zamislim da bi se ovo svidelo tinejdžerima. Knjiga je savršena prezentacija onoga kako matorci misle da mladi govore i misle. Imala sam transfer blama sve vreme. Neprirodna i isforsirana naracija, nakaradni spoj arhaičnog i modernog. Istina, Ostin je zamislila knjigu kao parodiju na gotske romane, što bi donekle opravdalo apsurdnost moderne verzije - možda joj dajem previše kredita, možda samo opravdavam ali shvatam u kom pravcu je možda trebalo da ide...ali konačni rezultat to ničime nije pokazao. Možda bi bilo bolje da je napravila veliki zaplet, ubila Belu Torp na sadistički način i zapravo napisala verziju u atmosferi u kojoj bi se osećala prijatnije kao pisac . Dve zvezdice samo iz poštovanja prema književnici. One of my many weaknesses as a reader of fictions is my inability to resist a novel that purports to have anything to do with Austen. A retelling, a continuation, or anything of that sort, and I want it desperately, no matter how terrible it looks. In this case, though, I was hopeful. I enjoyed the Austen Project Sense and Sensibility fairly well and the cover of Northanger Abbey is gorgeous. Plus, Austen’s Northanger Abbey is on For more reviews, Cover Snark and more, visit A Reader of Fictions. One of my many weaknesses as a reader of fictions is my inability to resist a novel that purports to have anything to do with Austen. A retelling, a continuation, or anything of that sort, and I want it desperately, no matter how terrible it looks. In this case, though, I was hopeful. I enjoyed the Austen Project Sense and Sensibility fairly well and the cover of Northanger Abbey is gorgeous. Plus, Austen’s Northanger Abbey is one of my favorite of Austen’s novels. This seemed like a safe bet. Famous last words. Northanger Abbey by Val McDermid has the plot down but lacks the heart. What I’ve noticed about both Austen Project novels is that they are very close retellings. McDermid has all the key elements of Northanger Abbey in place. The stories are modernized, yes, but so true to the original as to often feel a bit awkward. On the one hand, it’s nice how well they adapt the stories for a modern setting, but I feel like more work would really have sold it. Worse, I don’t feel like McDermid puts her own touch on Northanger Abbey. She doesn’t add any new depth or meaning to Austen’s story. Then again, I did find McDermid’s Catherine to be perhaps slightly more intelligent. There’s less made of her fancies about what might have happened in the Tilney’s house. Cat’s an avid reader, obsessed with vampires rather than the gothic. She’s almost a Jane Bennet figure in McDermid’s retelling, determined to think the best of people but with a bookish twist. This change could have been an interesting one if it carried through. Unfortunately, it’s offset by the painful texts that everyone in the book sends. A girl as smart and bookish as Cat seems to be would not send this: “I’m OK. Fone ws dead b4. Looking 4ward 2 seeing u. Mist u all. C u soon.” Now, some people do engage in texts that hurt me, I’m sure, but it’s basically everyone who texts like this, even if it doesn’t fit their character. The worst part is how much this seems to be textspeak written by someone who’s never written or read any actual text messages. I mean, this book is modern and Cat presumably has a smart phone since it can access facebook and the internet. Smartphones have autocorrect so texting like this happens less often. The letter abbreviations probably still happen, but why fone and the utterly puzzling “mist” in place of missed? The latter makes it sound like she’s going to break out the spray bottle on her family when she gets home. It’s a small thing, but I groaned every time. Mostly, I think McDdermid’s retelling utterly fails to capture the magic of Northanger Abbey, also known as Henry Tilney. He’s here and he’s nice and he likes to read, but he’s one of my favorite fictional heroes and I didn’t do a bit of swooning. He’s not as funny or wonderful here. He’s a lot of what makes the book for me and the Henry Tilney in this Northanger Abbey is rather flat. McDermid does make a change at the very end, to explain the circumstances of Cat’s departure from Netherfield. It’s kind of interesting and kind of infuriating. It’s also one hundred percent stolen from the end of Bend It Like Beckham. The execution again felt clunky and I’m not entirely comfortable with the way it was handled. It's really hard to effectively update a Jane Austen story. Clueless is the only contemporary version that works for me. I enjoyed Bridget Jones, but not as Austen, just as a story that used some Austen character names. I'm also a fan of the gothic, and read way too many gothic romances in my teens, so I feel like I get what Austen way saying in Northanger. It is, in fact, my favorite. McDermid's version is really pleasant as a modern novel, and I loved the stuff about The Fringe Festival, but t It's really hard to effectively update a Jane Austen story. Clueless is the only contemporary version that works for me. I enjoyed Bridget Jones, but not as Austen, just as a story that used some Austen character names. I'm also a fan of the gothic, and read way too many gothic romances in my teens, so I feel like I get what Austen way saying in Northanger. It is, in fact, my favorite. McDermid's version is really pleasant as a modern novel, and I loved the stuff about The Fringe Festival, but the efforts to update the source material were often rather awkward. The text-speak came across as condescending in the way dialect does in 19th century literature. Thankfully, there isn't too much of that. But Cat investigating the castle at night came across as pure Nancy Drew, and the where-are-they-now ending was hilariously cruel and it gave enough time for the main romance to feel believable and appropriate. The god end happily, and the bad are punished, and sometimes that's all one needs from a book. Liked it, didn't love it, much like the Trollope S&S (I liked this a little better). Things that bugged me: Henry too old and Catherine too young. It was fine in 1798 but in 2014, I would have been happier if she were, say, 19 and he 21 and still at university. Like the Trollope S&S, this was a nearly scene-by-scene recreation and while one imagines the suits at Harper saying, "Don't leave anything out or Those Austen People will be at the gates with torches and pitchforks," it is frankl Liked it, didn't love it, much like the Trollope S&S (I liked this a little better). Things that bugged me: Henry too old and Catherine too young. It was fine in 1798 but in 2014, I would have been happier if she were, say, 19 and he 21 and still at university. Like the Trollope S&S, this was a nearly scene-by-scene recreation and while one imagines the suits at Harper saying, "Don't leave anything out or Those Austen People will be at the gates with torches and pitchforks," it is frankly a little annoying. But it had some humor, and the transfer from Georgian Bath to the Edinburgh Festival worked well. Although I found this book a quick read. I didn't like some of the teenagers in this book. They were selfish and horrible. Even the main character Cat needed to grow up a lot. She lived in a story world and not in the real world. She was annoying at times. 'I've never begrudged a penny spent on books' the General said 'A book is the means by which a man can better himself'. Her father rolled his eyes. 'Spare us the melodrama, Cat. ..., it is not the f Although I found this book a quick read. I didn't like some of the teenagers in this book. They were selfish and horrible. Even the main character Cat needed to grow up a lot. She lived in a story world and not in the real world. She was annoying at times. As part of the Austen Project series, Val McDermid has rewritten Northanger Abbey into a 21st century setting. Catherine Morland, daughter of a minster and homeschooled, is happy to escape Piddle Valley to accompany the Allens to the Edinburgh Fringe Festival. There she makes new friends - the lively Bella Thorpe and the more refined Ellie (Eleanor) and Henry Tilney. Catherine is an avid fan of Twilight and on Bella's recommendation, begins devouring Morag Fraser's Hebridean Harpies and other (i As part of the Austen Project series, Val McDermid has rewritten Northanger Abbey into a 21st century setting. Catherine Morland, daughter of a minster and homeschooled, is happy to escape Piddle Valley to accompany the Allens to the Edinburgh Fringe Festival. There she makes new friends - the lively Bella Thorpe and the more refined Ellie (Eleanor) and Henry Tilney. Catherine is an avid fan of Twilight and on Bella's recommendation, begins devouring Morag Fraser's Hebridean Harpies and other (invented) paranormal novels. As much as she loves their friendship with Ellie and Henry, Catherine thinks there might be something strange with the Tilney family and their Gothic wonderland, Northanger Abbey, naively oblivious to more likely relationship disasters. McDermid is faithful to the original Austen plot and is quite creative in finding modern equivalents. I thought making Edinburgh during the festival and the Borders region in Scotland as the setting instead of Bath was creative. Modern youth slang, Facebook, texting and wifii are snuck in seamlessly. Half the pleasure was in seeming the different parallels between the original and modern day plot. Having said that, the adaptation does lack some of the lightness of touch and life of, say, the Lizzie Bennett diaries or even Bride and Prejudice . I thought using a teenage enthusiasm for Twilight as a springboard to Catherine talking herself into believing the Tilneys might be vampires or up to something thrillingly sinister had definite possibilities. Yet it didn't quite gel, partly because it felt as Dermid see-sawed between the vampire hypothesis (with Henry as Edward) to the General being a wife-killer or kidnapper (which seemed a bit forced onto the Vampire theory). And while the bullet in the Bible was explained (the obvious), the blood stain never was. Still, I enjoyed reading this modern-day Northanger Abbey as it came its expected HEA. read, this book will change your mind about that and make you want to read the original aswell. This book was written as part of 'The Austin Project' where some authors are taking a Jane Austin book are rewritting in it modern times. Whether or not people like sequels, prequels, spin offs or modern retellings of classic literature is always going to be a personal thing I think. I find them interesting and like any other genre there are good and bad amongst them. In ‘Northanger Abbey’ Val McDermid has done a good job of setting the story in twenty first century Edinburgh at the time of the Festival. I think she has captured the atmosphere of the Festival extremely well. I was less convinced by some of the characters though I d Whether or not people like sequels, prequels, spin offs or modern retellings of classic literature is always going to be a personal thing I think. I find them interesting and like any other genre there are good and bad amongst them. In ‘Northanger Abbey’ Val McDermid has done a good job of setting the story in twenty first century Edinburgh at the time of the Festival. I think she has captured the atmosphere of the Festival extremely well. I was less convinced by some of the characters though I did like Henry Tilney – a lawyer in this incarnation – and ‘Cat’ Morland – still a vicar’s daughter and immersed in reading vampire fiction. Isabella Thorpe (Bella) is just a nasty piece of work however you look at her and whatever century she is set in. We’ve all met versions of Bella. John Thorpe translates into a petrol head who is always boasting about how quickly he got from A to B.
I did enjoy reading this version of ‘Northanger Abbey’. It has the light-heartedness of the original and it retains the classic – and rather sweet – love story. What I didn’t like, even though it is probably authentic, was the language used in the dialogue. Изпълнена съм с признателност, че на някой му е хрумнало идеята да се преразкажат любимите романи на Джейн Остин в модерен вариант. Душата ми ликува. Не съм чела нищо от Вал Макдърмид, не знам какъв й е стила на писане, но съм възхитена колко умело е усетила и пресъздала характерното писане на Остин. Имах чувството, че наистина чета нещо от моята любимка. Блестящо се е справила Макдърмид да пресъздаде този типичен начин на изразяване и поведение на героите на Остин, който им придава плът и кръв в Изпълнена съм с признателност, че на някой му е хрумнало идеята да се преразкажат любимите романи на Джейн Остин в модерен вариант. Душата ми ликува. Не съм чела нищо от Вал Макдърмид, не знам какъв й е стила на писане, но съм възхитена колко умело е усетила и пресъздала характерното писане на Остин. Имах чувството, че наистина чета нещо от моята любимка. Блестящо се е справила Макдърмид да пресъздаде този типичен начин на изразяване и поведение на героите на Остин, който им придава плът и кръв във въображението ти. Трудничко ми беше да възприема, че съвременни младежи ще се държат по начина, по който нашите герои, но точно като главната ни героиня въображението ми е е богато и веднага си направих логически връзки, които напълно да оправдаят странното им поведение в една съвременна Шотландия. Прекрасен роман за предизвикване на усмивка на лицето. Не му трябва на човек розови хапчета, за да се почувства лек и доволен. Трябва му модерен вариант на роман на Остин, който да е лек, приятен, вълнуващ с нотка интригантство, щипка любов, готическо имение и изненадваща развръзка. :Р Така се вживявах, че на моменти се усещах, че ще почна да крещя по героите, които ме дразнят и да се разтапям с героите, които харесвам. This review has been hidden because it contains spoilers. To view it, click here. Disappointing. If you're going to write a modern adaptation of the novel, ADAPT it. Don't translate every line into your idea of modern teenager speak. Why would an up-and-coming lawyer be interested in a 17-year-old? The whole incident with Cat getting kicked out of NA just doesn't make sense. General Tilney keeps making comments about the Allen's financial situation (just like the original, implying that Catherine is somehow tied to their money), then what ultimately makes him reject her is her Disappointing. If you're going to write a modern adaptation of the novel, ADAPT it. Don't translate every line into your idea of modern teenager speak. The whole incident with Cat getting kicked out of NA just doesn't make sense. General Tilney keeps making comments about the Allen's financial situation (just like the original, implying that Catherine is somehow tied to their money), then what ultimately makes him reject her is her supposed "lesbianism". Really? If that's going to be the reason, make a bigger deal out of their supposedly suspicious activities. This book just fell so flat for me. So many plot holes, under-developed characters, overly-simplified characters, etc. Save your time and reread the old one, then save even more time and watch the version with JJ Feilding (yum!). I like Val McDermid. Well, I like her crime novels and I love Northanger Abbey but whoever put these two together obviously was having a bad day. I did not like it at all and I'd like back the four hours I spent reading it please. It's a fairly straight forward retelling of the original but written for teenagers? Twilight addicts? I don't know who but it definitely wasn't me. The only major change was the excuse for General Tilney to throw Cat out of the house and when I read that? I had a total I like Val McDermid. Well, I like her crime novels and I love Northanger Abbey but whoever put these two together obviously was having a bad day. I did not like it at all and I'd like back the four hours I spent reading it please. It's a fairly straight forward retelling of the original but written for teenagers? Twilight addicts? I don't know who but it definitely wasn't me. The only major change was the excuse for General Tilney to throw Cat out of the house and when I read that? I had a total WTF moment and could have quite cheerfully slapped myself, never mind anyone else. Is that seriously the only reason they could come up with in the 21st century? If you are in any way a fan of Northanger Abbey and Henry Tilney I urge you not to read this and instead (re)read Austen's book. I should have known it was likely to wind me up after my friend demonstrated how she threw Joanna Trollope's Sense & Sensibility against a cupboard door leaving a huge dent and wasn't worried about the book. If you know Jane Austen's original story, you know the plot for this book. The differences being a modern setting, in which Cat Morland, a home-schooled vicar's daughter, goes with neighbors to the Edinburgh Festival in Scotland. She's excited to her boring village and finally have adventures. At first she finds herself being dragged along with Susie Allen into the exhausting and not super fun social whirl, but when she meets Henry Tilney at highland dance lessons, she finally begins having fun. If you know Jane Austen's original story, you know the plot for this book. The differences being a modern setting, in which Cat Morland, a home-schooled vicar's daughter, goes with neighbors to the Edinburgh Festival in Scotland. She's excited to her boring village and finally have adventures. At first she finds herself being dragged along with Susie Allen into the exhausting and not super fun social whirl, but when she meets Henry Tilney at highland dance lessons, she finally begins having fun. When Henry disappears from her life, she tries to forget about him, though it's hard. When she's introduced to the Thorpe family, she immediately finds a friend in Bella. Bella introduces her to the Herbridean Harpies series of novels and her boorish brother Johnny. When Henry Tilney finally returns, he brings his charming sister Ellie with him and Cat is eager to make the acquaintance of her crush's sister. Cat finds Ellie a good friend in her own right and is eager to hear more about the Tilney family home Northanger Abbey. When she's invited to visit Northanger, Cat is thrilled, except for when she finds out it's off the grid. What reason do the Tilneys have for being shut off from the world? Why is there no trace of the late Mrs. Tilney? Why are the Tilneys so obsessed with the weather and not going out when the sun is strong? Do they actually have reflections? Could it be... are the Tilneys vampires? It's either that or General Tilney is some kind of cruel monster who abused his wife and could be keeping her locked in a tower! OMG! Cat is determined to get to the bottom of the mystery but her curiosity may jeopardize her friendship with Ellie and her growing relationship with Henry. Out of all of Austen's books, I think this one is the most easily translated into modern times, except that's where the book fails. The author took each scene and tweaked it and rewrote the dialogue and references to fit the modern setting. I think that created a lot of problems, such as: why would the Morlands let their teenage daughter go off to visit strangers they've never met? My parents would never have allowed it without first speaking to Gen. Tilney. It makes more sense in the smaller social setting of the 18th century when the Morlands would be looking to make an advantageous match for Catherine and probably would have been aware of the Tilneys and Northanger Abbey. Also, why is a grown man with a job still under his father's thumb? I get his and Ellie's sympathy for their father, but that doesn't mean Henry has to put up with his father's martinet ways. Ellie has an excuse, still being dependent on her father for financial support and making her dream come true. Another problem I had with the book is the relationship between Henry and Cat. He's a young adult in his 20s, an up and coming lawyer and he's interested in a 17 year old? It happens but it's a little more icky today than it was in the 18th century when Jane Austen wrote her original story. The reason Gen. Tilney gives for kicking Cat out of the house came as a huge surprise. It was so completely out in left field and didn't make much sense with the rest of the story. This story also lacks the beautiful language and witty dialogue that marks Jane Austen as a master. It's funny at times, and I especially liked the dialogue between Cat and Henry when they were alone, but it's not completely at the level of Jane Austen. She poked fun at the craze for novels and created a whole new genre of literature. It's hard to match that. I don't feel the story quite manages to poke fun at modern teens but instead serves up a mild message at the end. The characters aren't really new. Cat is at times a ditzy teenager and a typical young woman of the modern world: constantly on her phone checking Facebook and e-mail, gossiping about hot male celebrities and loving the Twilight movies. She doesn't have any ambition or thoughts beyond the present. I kept groaning and thinking "Oh my god! How can she think that? She's so stupid!" Yet, I kind of liked her because she's polite and she is mildly interested in good literature. She references Jane Eyre (and The Wide Sargasso Sea) and has access to other classics like Dracula. She's intelligent enough to know vampires aren't real, but can't resist letting her imagination run away with her. I liked her character development and how she grows up and learns to think about her future. I especially like what she had to say to Henry Tilney at the end when he comes to apologize. Unfortunately, what she says next made me annoyed with her again. Overall, she's a bit more appealing that her original counterpart. The Tilneys are slightly different from their original counterparts. I really liked Henry. He's funny and fun to be around for the most part. He's intelligent and well-read, but sees the value in popular literature. I always thought the original Henry was gently poking fun at Catherine but this Henry and this Cat manage to match wits and she understands his teasing. He's a good big brother, an excellent lawyer, yet I disliked how he allowed his father to control him. I wanted him to go for his dreams. Ellie is a sweet girl. She's not well developed but has potential to be the heroine of her own story. I felt sorry for her because Gen. Tilney is almost exactly the same as he was in the original. He belongs in a Jane Austen novel. Freddie is also as Austen described. The Allens are unappealing characters. Susie is the type Jane Austen liked to make fun of and Mr. Allen isn't much better. They very shallow people and shallow characters without any depth. The Thorpes are exactly the same as they are in the original. Isabella or Bella, as she prefers, is incredibly annoying and self-centered. Johnny is worse and pretty much as Austen wrote him. They're the characters you love to hate. I've never read a Val McDermid. I have though, read every Jane Austen. The Austen Project fascinates me, as I've loved many of the cinematic adaptations created from her novels (Clueless being my favourite) and love seeing how contemporary writers/directors use her words and stories. Without any knowledge of McDermid's work though, if her fans are expecting her usual voice and style to shine through, I think you may be disappointed. It's not a McDermid book. By that, I don't mean that this book i I've never read a Val McDermid. I have though, read every Jane Austen. The Austen Project fascinates me, as I've loved many of the cinematic adaptations created from her novels (Clueless being my favourite) and love seeing how contemporary writers/directors use her words and stories. Without any knowledge of McDermid's work though, if her fans are expecting her usual voice and style to shine through, I think you may be disappointed. It's not a McDermid book. By that, I don't mean that this book is disappointing. Far from it. Simply that it's written in the style of Austen as far as possible in a modern context and follows the plot of the original exceptionally closely (with contemporary adaptations. More on those shortly). And anyone reading this who's not a fan of Jane Austen, don't stop now thinking this isn't for you. It's a well-told story with humour, romance and a (small) touch of mystery. I decided to read the original directly before starting this, so it was fresh in my mind as I sped through the new version. Northanger Abbey was never in my mind one of Austen's most accomplished novels, with a slightly too naive heroine, but with wit evident and a nice romantic element. McDermid has clearly thought hard on how to update every element and I think she did a marvellous job in making this 200-year-old book accessible and fresh, while keeping so closely to the original. To summarise, Catherine Morland, daughter of a working-class vicar and his wife is invited to the Edinburgh festival by wealthy family friends. Feeling lost among strangers, she indulges in imaginative bouts, enjoying outlandish vampire stories. She is befriended by the charming Bella Thorpe and her overpowering brother Johnny, who both try and commandeer Cat away from another pair of siblings, the much more likeable Ellie Tilney and her witty brother Henry. Eventually, Cat is invited to the Tilney home, the gothic abbey of the title, where her imagination runs riot with vampiric plots revolving around the Tilneys' dead mother and their brusque and cold father, General Tilney. All of this could be straight out of a contemporary Young Adult story. Which just goes to show how applicable some of our classic authors are. I found Cat herself more likeable than in the original, she's less annoyingly innocent (though still slow to catch on at times). Henry makes a wonderful (if still underused) love interest. He's not meant to be Darcy - he's younger, and a second son with an overbearing father, but still someone you can develop a crush on. Bella and Ellie are very much as they are in Austen's writing, one all sweetness and the other all hypocrisy. Minor characters that are there to turn the plot. My favourite is still Johnny - deliciously arrogant and someone you want to punch. Very well updated - the love for his horse replaced by a love of fast sports cars. In the original, Cat is a gothic fiction obsessive, so to make her equivalent a vampire/horror fan seemed appropriate, though still of course very silly in a 17-year-old! I liked the substitution of Edinburgh for Bath. Bath has less cultural significance today, and McDermid has managed to get a lot of comedy out of the shows and setting of this Scottish city. Austen's language and words are cleverly woven into the book, closely enough that conversations are the same in direction and content, though this does leave the current author's voice absent. But if this considered a piece of fan fiction it's very well done. I think I caught an authorial 'dig' or two though, a short rant against poets: "the more obscure their verse, the more praise they appear to garner" as well as other snippets of her own thoughts popping out. Enjoyed those. Where McDermid changes something vital for me is in making Austen's subtlety vanish - telling us explicitly things we can infer, telling us what Cat hasn't noticed. Not letting us spot these things ourselves. Didn't like that aspect. It's part of Austen's dig at characters' flaws that I really like. I also wasn't happy with the reason for Cat's sudden departure from one location (no spoilers here!) - while I can see that a change had to be made to the original to make sense today, this change shocked me somewhat and felt wrong. See if you agree with me. The contemporary references to wi-fi, 'selfies' and Twitter will help readers feel at home in this story. Harry Potter, Julia Donaldson and Jane Austen herself are all referenced. Some readers won't understand the joke about Mrs Danvers though. She's made it feel very current. All-in-all, I loved it. Very well constructed out of the bones of Austen's original. Faithful to the tone, character and message. For students studying Northanger Abbey, reading this alongside it will bring up a wealth of discussion points on modernising classics and the differences in society that have taken place. For those of us reading for pure pleasure, you'll find a lot of that here, and I hope if you've never tried Austen that Val encourages you to do so. I'll start by saying I love Austen's Northanger Abbey. It is in my top three favourite books of hers and one I often re-read. I am always wary of re-workings of Austen novels as there have been mixed successes in the past. I enjoyed Val McDermid's modern day re-working of this classic. Moving the story to Edinburgh works well. The Gothic atmosphere of the old city is an excellent backdrop to fuel Cat Morland's vam I received a copy of this book from the publishers in exchange for an honest review. I enjoyed Val McDermid's modern day re-working of this classic. Moving the story to Edinburgh works well. The Gothic atmosphere of the old city is an excellent backdrop to fuel Cat Morland's vampire fuelled Gothic romance fantasies. Henry Morland retains his charm and sense, Bella is as vacuous and self-centred as always and the General as conceited and rigid as he should be. Cat has retained some of the annoying traits that are evident in the original, she holds on to the ridiculous notions of vampires and murder in a way that you wouldn't expect someone who is nearly 18 to still retain. Some of this is explained by her somewhat sheltered childhood being home schooled. The childishness of this belief in fiction is grating, somewhat more than it is in the original as it would seem more likely that such believes would be held for longer in an age when the abundance of knowledge and the easy availability of it has rendered some superstitions and horrors obsolete. I think this is probably one of the difficulties to be overcome when re-writing classics in the modern age and isn't any reflection on the author. However given it is part of Cat's character and a driving force of the story it would be hard if not impossible to remove this aspect of Cat and the story-line and so has rightly remained. She has won many awards internationally, including the CWA Gold Dagger for best crime novel of the year and the LA Times Book of the Year Award. She was inducted into the ITV3 Crime Thriller Awards Hall of Fame in 2009 and was the recipient of the CWA Cart Val McDermid is a No. 1 bestseller whose novels have been translated into more than thirty languages, and have sold over eleven million copies.